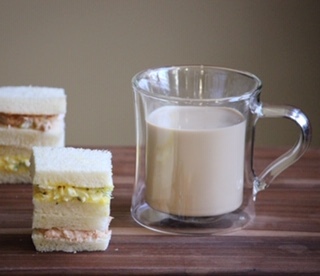 Simple finger sandwiches are fun to make. For both egg salad and tuna salad, chopped onion is essential for the crunch and the kick. If you don’t like raw onion, you can skip it or substitute it with chopped celery (increase the amount of chopped celery for the tuna salad). Another key is Japanese mayonnaise. It’s a little bit more sour compared to American ones. For the tuna salad, some ketchup is added for sweetness. Invite your friends for a casual afternoon tea! Gently put eggs in a small pan. Pour water to cover the eggs and put the pan over medium heat, covered. When the water comes to a full boil, remove from heat and let it sit for 7 minutes. Peal the eggs. Remove all the shell. In a small bowl, put the boiled eggs and with the back of a fork, smash the eggs into small pieces. Add onions and capers to the eggs. Add mayonnaise and parsley and mix. Put half of the egg mix onto a bread and put another bread on top. Do the same with another set of the bread. Stack the sandwiches and cut off the crust. Cut the sandwiches in four. Put half of the tuna mix onto a bread and put another bread on top. Do the same with another set of the bread.